Stories and Memory Keeping. Fun Ideas & Happy Colors. It’s Stacy Day and can I just say how smart it is to create a day for yourself each month? This is because you can intentionally stop and think about life and your blessings and throw yourself a little ME party. This morning when the “Stacy Day” reminder popped up on my phone, I decided I would take my morning walk down to the river, because I love walking by the river. Doing this took longer and put me back a bit on my to-do list, but oh-well! On Stacy Day I give myself permission to practice a greater degree of self-awareness and self-kindness. This has proven to be an effective strategy which helps me ward off the other kind of me-centered ‘pity’ party that we sometimes invite ourselves to. I know you know this, but it is important to recognize the strides YOU are making and the positive things you accomplish, because more than anyone else, YOU are the one who needs to stop and take notice. YOU are the person responsible for your happiness. Stacy Day, AND the day that I am officially 53 1/2. A perfect day to share my most recent Story Starter, which is all about ME (at 53). Will you (pretty please) do this for me? Make a book about YOU. 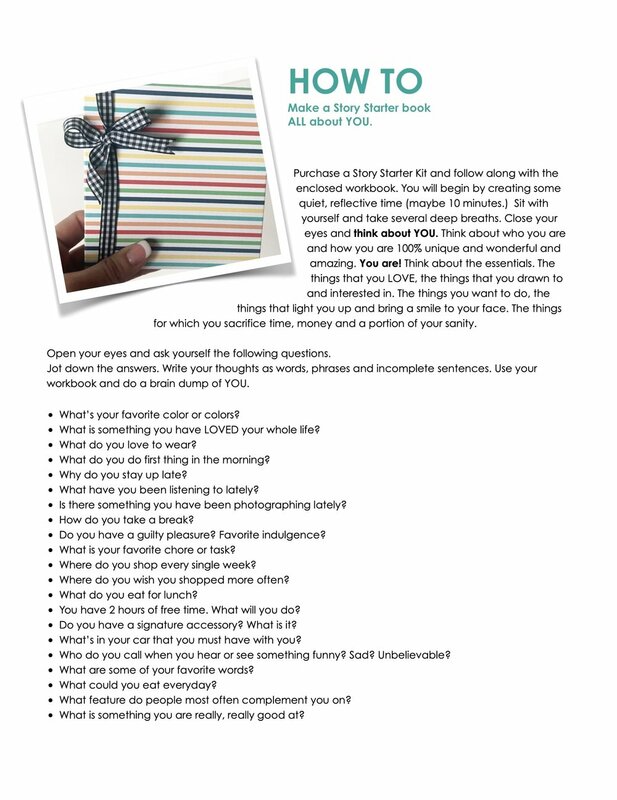 I created a PDF download with questions designed to help you remember and recognize the details you’ll want to document in your ME book. I am teaching this process at the Arizona Pinner’s Conference this weekend. I’m teaching Story Starter, because I WANT people to tell their stories and I WANT to show them how easy it is to retrieve specific, sensory memories in detail. The detail that you can recall when adequately prompted is kind of mind-blowing actually. We have the memories inside of us, we just need to invite them out and then organize them into story snippets, preserve them and share them. It truly is that EASY. So, here’s where you purchase a Story Starter Kit. The stamp sets that were created to support Story Starter are Colorful Textures and Quotable Words. And, the Simply Said stamp set is super-flexible, sans-serif font perfectly sized for smaller projects! As a side note, I used the Thin Cuts—Block Alphabet and my new Cuttlebug to cut the “ME” letters on my title page. Ink and cardstock colors are: Lagoon, Clover, Candy Apple Red, Tangerine, Lemon and Sapphire. If you don’t yet have a CTMH consultant, you can purchase online and then locate one during the check out process. I really believe what I said in my little video. Validating and celebrating the person you are (right now, today—in all your imperfection) is essential to your happiness, confidence and ability to reach out to others in love. Go visit your attic of memories and open up the box marked “Me” and then explore all the goodness inside. Have you ever heard this, “Before you can choose JOY, you have to choose YOU!” I saw this today on the @goodlifeproject Instagram account. These words are not suggesting selfishness, they are suggesting that we must recognize who we are and what lights us up, so that we can create JOY inside of and around us. We are headed into the season of JOY and we need to be ready to create and recreate the magic. Its up to us. Telling your story will help! !